he largest ultra 4 race in the country has several competitors from right here in Salt Lake City. The King of Hammers offroad race was held on public lands in Johnson Valley, Calif. Feb. 4-10. The event includes a motocross, UTV, every man’s challenge and professional division races. “I have been down to help other drivers and watch several times. This will be my first time as a driver. I do not have any experience as a driver,” said Matt Murphy, better known as ‘Murf Dog’ by his friends and competitors. 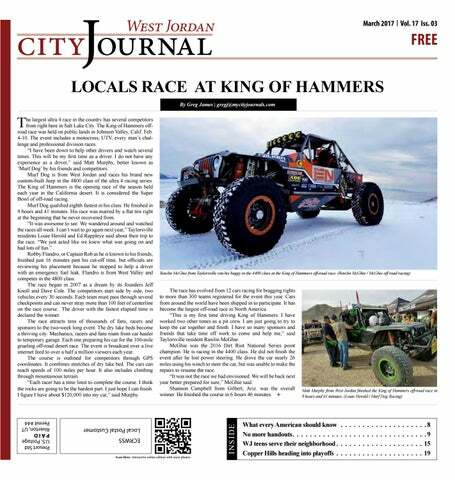 Murf Dog is from West Jordan and races his brand new custom-built Jeep in the 4800 class of the ultra 4 racing series. The King of Hammers is the opening race of the season held each year in the California desert. It is considered the Super Bowl of off-road racing. Murf Dog qualified eighth fastest in his class. He finished in 9 hours and 41 minutes. His race was marred by a flat tire right at the beginning that he never recovered from. “It was awesome to see. We wandered around and watched the races all week. I can’t wait to go again next year,” Taylorsville residents Louie Herold and Ed Rappleye said about their trip to the race. “We just acted like we knew what was going on and had lots of fun.” Robby Flandro, or Captain Rob as he is known to his friends, finished just 16 minutes past his cut-off time, but officials are reviewing his placement because he stopped to help a driver with an emergency fuel leak. Flandro is from West Valley and competes in the 4800 class. The race began in 2007 as a dream by its founders Jeff Knoll and Dave Cole. The competitors start side by side, two vehicles every 30 seconds. Each team must pass through several checkpoints and can never stray more than 100 feet of centerline on the race course. The driver with the fastest elapsed time is declared the winner. The race attracts tens of thousands of fans, racers and sponsors to the two-week long event. The dry lake beds become a thriving city. Mechanics, racers and fans roam from car hauler to temporary garage. Each one preparing his car for the 100-mile grueling off-road desert race. The event is broadcast over a live internet feed to over a half a million viewers each year. The course is outlined for competitors through GPS coordinates. It combines stretches of dry lake bed. The cars can reach speeds of 100 miles per hour. It also includes climbing through mountainous terrain. “Each racer has a time limit to complete the course. I think the rocks are going to be the hardest part. I just hope I can finish. I figure I have about $120,000 into my car,” said Murphy. From dump to donation: How the Trans-Jordan Landfill saves bikes and benefits those in need The West Jordan City Journal is a monthly publication distributed directly to residents via the USPS as well as locations throughout West Jordan. For information about distribution please email circulation@mycityjournals. com or call our offices. Rack locations are also available on our website. For subscriptions please contact: circulation@mycityjournals.com The views and opinions expressed in display advertisements do not necessarily reflect or represent the views and opinions held by Loyal Perch Media or the City Journals. This publication may not be reproduced in whole or in part without the express written consent of the owner. The Mayan God Quetzalcoatl has many similarities to Jesus Christ and His Doctrine. You will learn of the many Spiritual and Temporal witnesses between the Book of Mormon and Pre-Columbian History. Including Photos and Information from lDS and Non-lDS Scholars and archaeologists. he Salt Lake County library system inaugurated a new mascot on Jan. 30 at the West Jordan Library. There were many different mascots that were up for the position, including a turtle, elephant, owl, squirrel, cat and a dog. In order to decide the winner, the library system held a mock election process that mirrored to United States elections. This was done with the purpose of educating youth about the voting process. The election began on Oct. 10 with the library hosting a primary election. According to the county library website, “...emotions were high. A write-in candidate, Chinchilla… quickly proved to be a threat to several candidates. Additionally, mid-primary, an ad aired that didn’t present the elephant in a favorable light. In the end, Owl and Turtle prevailed and advance to the mascot general election.” The general election was held from Oct. 20 through Nov. 8. The community could vote through Facebook, Twitter, Instagram, and by going to different library branches. Individuals were also allowed to endorse their candidate on social media with the hashtag #VoteCountyLibrary. On Dec 5., it was announced that the owl that had won the election. Welcomes board certified Pediatric Orthopedic Surgeon, Shari Gabriel M.D., to our Salt Lake City office. learned UDOT was collecting properties through eminent domain. “I was just shocked,” she said. “I was never contacted. I had to be the one to contact UDOT myself.” An appraiser came to look at Jensen’s home and told her how mch they’d pay her to leave her home. Jensen said it’s hard to leave because she loves the area but said she’s mostly frustrated because she wasn’t given a definite timeline. “I would have liked to build my own home, but they took so long to give me a timeline that I had to buy a home that was already built,” Jensen said. Jensen’s house, along with many in her neighborhood, was only seven years old. She and her neighbors voiced concerns that UDOT should have known about the acquisition process long before their homes were built and stopped development from occurring. TEACHER/HERO DAY All active & retired military, first responders, and teachers qualify for one FREE ticket on Fri., March 10. Meet DIY Network Star Jason Cameron Jason Cameron, Ohio native and star of DIY Network’s Desperate Landscapes, Man Caves, and Sledgehammer, is a jack of all trades. When he’s not getting his hands dirty outside in the yard, he can be found tearing down walls to create unique and over-the-top spaces to match anyone’s personality. As a licensed contractor with years of experience under his belt, Cameron understands how to transform any space, including the backyard and landscaping around the home, into a homeowner’s dream. Mountain America Credit Union Celebrates Opening and Ribbon Cutting of New Kearns Branch The Kearns 5600 West Branch provides a wide range of financial products and services, including traditional savings, insurance, investments, auto and RV loans and a full array of mortgage loans and services. Mountain America also offers the innovative MyStyle CheckingSM account with customizable rewards. Being federally chartered, Mountain America provides an additional broad assortment of services, including real estate and business lending. meeting. “Our goal for the design of the community was to create a new neighborhood that incorporates the agricultural heritage and natural beauty of the site with high-quality development.” A ravine runs through the southeast portion of the site and was the original site of the Jensen family homestead, so the designers decided to preserve the green spine and use it for trails and parks space. While the council members agreed that the section of the city was better than most for high-density development, some city council members thought a larger commercial section of the land would serve the city better. The City of West Jordan will be electing Council Seats for Mayor, two At-Large Council Members, and a two-year term for Council District 4 during this year’s municipal election. To declare Candidacy to run for a Council District position, the filing period this year is as follows: Thursday, June 1, 2017, through Wednesday, June 7, 2017, 5 p.m., in the City Clerk/Recorder’s Office, City Hall, 8000 South Redwood Road, 3rd floor. For more information regarding the upcoming Municipal Election, please contact Melanie Briggs, City Clerk, 801-569-5117. All positions have four-year terms, except Council District 4. If you are interested in running, listed below are the requirements: 1. Be a United States citizen. 2. Be at least 18 years old. 3. Be a resident of the municipality or a resident of the recent annexed area for at least 12 consecutive months immediately preceding the date of the election. 4. Be a registered voter of the municipality. 5. If declaring for Council District 4, live within the boundaries (which are in the area of 7800 South and Old Bingham Highway from Bangerter to west of U-111). Apply Now to Serve on Ethics Commission Are you passionate about holding our elected officials to the highest of ethical standards? If you meet the following qualifications, please consider applying for appointment to our newly created West Jordan City Ethics Commission. Ethics Commission Member basic requirements: 1. Some commission positions require City residency – others do not. 2. You cannot currently be an official, officer, or employee of the City. 3. You must be 18 years of age or older. 4. You must have a high ethical and moral character. In addition to the basic requirements listed above, each of the five commission members and one alternate member must meet one of the following sets of qualifications (there is only one position available for each set of qualifications listed): 1. You must have previously served as (but cannot currently be serving as) an appellate judge, district court judge, justice court judge, or administrative law judge in the state of Utah (City residency not required). 2. You must be currently serving as, or have previously served as, a prosecuting attorney or criminal defense attorney in the state of Utah (City residency not required). 3. You must be currently serving as, or have previously served as, a detective, a private investigator, or another type of professional investigator (City residency not required). 4. You must have previously served as (but cannot currently be serving as) a Municipal Mayor or Council member in the state of Utah (City residency not required). 5. You must be a current resident of the City, and must have been a resident of the City for at least one year. 6. The alternate must be a current resident of the City and must have been a resident of the City for at least one year. For more information, contact Heather Everett at 801-569-5100 or heathere@wjordan.com. Justice Center Renamed to Honor Fallen Officer This past month has been an eventful one. On Feb. 23, we renamed the Justice Center in honor of Officer Thomas M. Rees, our first officer killed in the line of duty on Feb. 23, 1986. We honor his sacrifice and loss by renaming the West Jordan Justice Center, which houses the West Jordan Police Department and West Jordan Justice Court, to the “Thomas M. Rees Justice Center.” I appreciate the service our police officers give to our community and recognize the sacrifice they are sometimes called upon to give. Unfortunately, West Jordan has lost two officers in the line of duty, and that is too many. In addition to Officer Rees, we also lost Officer Ron Wood who was killed Nov. 18, 2002, after being shot while pursuing a suspect. May we always remember those who have lost their lives to protect our way of life. In conjunction with this event, we also celebrated the 50th anniversary of the inception of the West Jordan Police Department and West Jordan Justice Court. Over the years, our department has evolved. Initially, police and fire were housed as one under the Department of Public Safety. In 1999 when the city passed the 75,000 population mark, police and fire were separated into their own departments to more effectively serve our growing community. Both departments continue to work closely to protect our residents and businesses. We also broke ground for a new public works building on Feb. 16. The building is being built on the site of the old facility, which was dedicated in 1986 when the city had 35,744 people. Today, West Jordan has over 110,000 residents. We have been working for the past seven years to get this facility built. The current building has safety issues, is outdated, and is too small to house the personnel and equipment that provide many of our core services. We also need additional space to store vehicles that are weather sensitive and service a variety of equipment that ranges from fire engines to lawn mowers and everything in between. The new building is designed to last 50 years and support our city at build out. Council meetings have also had many important topics on the agenda. Two that are still under discussion are changing the form of government from a Council-Manager form to a Strong-Mayor form, and also whether to move forward with a new Rec Center. Both topics are slated for the March 8 Council meeting, which takes place at 6 p.m. in the third-floor City Hall Council Chambers, 8000 S. Redwood Road. I invite you to attend and share your comments. 5600 West Road Widening Project from 7800 South – 8600 South Beginning this summer/fall, crews will widen 5600 West between 7800 South and 8600 South to four travel lanes. The project will also add a new signal at 8200 South, and bicycle lanes, sidewalk and a privacy wall where none currently exist. Work will occur during daytime hours and one lane of traffic will be maintained at all times. Motorists should anticipate delays. West Jordan has created a communications team to provide project impact information to the public. They can be reached at 888-966-6624 ext. 5 or by emailing 5600Wconstruction@wjordan.com. Bangerter Construction The Utah Department of Transportation (UDOT) has selected Ralph L. Wadsworth Company and W.W. Clyde as the Design-Build contractor for the Bangerter Interchanges project at 5400, 7000, 9000 and 11400 South. Construction is scheduled to begin in May 2017. Preliminary utility work, property acquisition activities, and home demolitions will be ongoing through the start of construction. The public is invited to an open house to learn about construction, and ask questions. Sign up for project emails at bangerter@utah.gov or call the project hotline at 888-766-ROAD (7623). 7000 South Utility Work Under Way Construction crews are upgrading the storm drain, sewer, and water systems on 7000 South between 1300 West and 3200 West from February through the fall of 2017. The work includes removing and replacing pipes, installing box culvert canal sections, removing and replacing old utility services, as well as milling and overlaying the roadway surface. When this project is complete, residents can expect improved utility service, improved roadway drainage, and a smoother, safer commute. During construction, 7000 South will be reduced to one lane in each direction. Heavy delays and congestion should be expected. Drivers should plan to use alternate routes. WHAT TO EXPECT • Construction is now under way and will last for about 8 months. • Drivers will see multiple work zones along 7000 South from 1300 West to 3200 West. Inside each work zone, traffic will be reduced to one lane in each direction. • Sidewalks may periodically close to accommodate the work. Alternate routes will be made available. The contractor will work with local schools to provide students with a safe route to school. • Mail delivery will continue throughout the project. • Residents in the work zone should bring garbage cans to the curb for pickup when traffic control is in front of your home. The contractor will ensure it will be collected. • Speed limits will be reduced in work area to 25 mph. • Signal timing in the work zones will be adjusted and left turns will be limited in the work zone to keep traffic moving. • Residential driveways and business access will be affected during construction. The project team will work closely with each property owner to notify them of any restrictions and to mitigate the impact. • Construction crews will be working Monday through Saturday from 7 a.m. to 7 p.m. to complete the work in the time allotted. Dust, noise, vibration and large construction equipment will be common in each work zone. STAY INFORMED Residents can stay informed about the project by visiting the West Jordan City website, www.wjordan.com and selecting the road alerts link. Sign up for email alerts or contact the project team by emailing construction@wjordan.com or by calling 801-569-5101. The City of West Jordan has a variety of job openings including Code Enforcement Officer, Building Inspector (Combination Inspector), Engineering Assistant, Events Manager, Facilities Maintenance Technician, Part-time Domestic Violence Victim Coordinator, Water Division Supervisor, Seasonal Parks Laborer, and Crossing Guards. Please spread the word and help us find good people. We are especially in need of crossing guards to help our children safely arrive at school. This is a great part-time job for someone looking for flexibility and extra income. Visit WJordan.com for more information and to apply. o Visual Arts (help plan art exhibits at City Hall’s Schorr Gallery) o West Jordan Symphony • Activities and Events – From the Demolition Derby to the Independence Day parade to the Memorial Day Tribute and everything in between, help bring these events to life. • Healthy West Jordan – Ready, set, RUN! The Healthy West Jordan Committee plans programs and events in an effort to keep our residents active and healthy. • Parks and Open Lands – Share your ideas on what types of parks we need and how we are going to pay for the maintenance and operations of them. • Sustainability – Help find ways for us to be more efficient in our use of water, energy and other resources and plan for the future growth in West Jordan. • Planning Commission – The Planning Commission helps determine the types of new homes that are built and where new stores and business are located. • Youth Theatre – help plan, produce, direct & stage some of the best local youth theatre productions. Email info@wjordan.com or contact City Hall at 801-569-5100 if you have questions about the committees or would like to apply. Volunteers Needed for Victim Assistance Program If you want to make a difference for women and men who are experiencing domestic violence and victims of violent crimes, West Jordan Victim Assistance Program (under the direction of the City Prosecutor’s Office) is just the place for you to get involved. Contact us about participating in our victim advocate volunteer training. On-call volunteers are trained to offer support, guidance and resources to victims and survivors of domestic violence. No experience necessary – just a clean record, empathy and willingness to learn and commit some time to our program. Training starts soon. Call 801-566-6511 or email ceciliab@wjordan.com for more information. City Hall 8000 S. Redwood Rd. 6 p.m.
Utah Youth Soccer Complex 7965 S. 4000 West 9 a.m. The City of West Jordan 8000 S. Redwood Rd., West Jordan, UT 84088 Join the conversation! Follow (801) 569-5100 www.wjordan.com West Jordan â&#x20AC;&#x201C; City Hall. At a time when emotions are tender, receiving guidance by someone who has been around and understands your needs can help you find the perfect service. Andrew K. Moore, MD Board Certiﬁed Infertility Specialist NOW PART OF Reproductive Care Center & accepting new patients! One coupon per visit per table. Not valid with any other offer. Expires 3/31/17. INCLUDES TAX, LABOR & INSTALLATION! While supplies last. Expires May 15, 2017. For the latest info on local business, follow us! 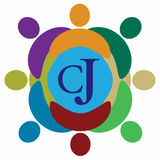 facebook.com/westjordanchamber www. Our West Jordan office features the latest in banking technology. The branch offers the expediency of self-service and no lines but also offers the one-on-one personal and expert attention you’ve come to expect from your GWCU Credit Union staff. The branch is a full-service branch; so, whether it’s a loan need, checking and debit services, insurance for your home and autos, or retirement planning, we have you covered. Eric Yuhas will manage all branch activity, originate mortgages and provide insurance services from the new office. Eric Yuhas has been employed by Goldenwest for over four years, and has over 20 years in the finance/banking industry. Summit Senior Living offers assisted living and memory support services in a brand-new, thriving community that provides residents with 24-hour care and support, complemented by an active, engaging lifestyle. 1996 & newer & older $35 for 1995 4/15/15. offer. with any other Cannot be combined Expires 4/15/15. With this coupon. Includ eze • Battery • Antifre Filter • Wipers • Air Belts • Lights • Fan Old nsion • Tires • Suspe4/15/15. Fashioned Ice 4/15/15. Cream and Lots of it! Expires With this coupon. Dine in only. One coupon per two (2) people per visit. Valid only at the Taylorsville & Draper locations. Must present coupon before ordering. Not valid with other discounts/promotions. Expires 4/14/15. with & Cleanin necessary X-raysAsk for details. Restrictions apply. Expires 4/18/15. Limit 1 per table. Expires 3/31/17. Passenger,OR MO RE Not valid light truck or SUV on valid on any other offer. only. Not previou NOT VALIDs purchases. PRICES. ON SALE Valid at Utah locations only. Some restrictions apply. Expires 10/15/1 4. Valid through 3/31/15 on reservations made by 1/15/15. Not valid 12/19/14 through 1/3/15. Valid for new reservations only. Rent a Snowmobile at regular price for one day, and get a 2nd machine or 2nd day for HALF OFF! 5/31/15 on reservations made by 1/15/15. Not valid 12/19/14 through 1/3/15. Valid for new reservations only. Less Than 2 Hours from SLC on Mirror Lake Hwy. Passenger, OR REA R only. Not light truck or SUV valid on purchases. previou Valid at Utah s location Expires s only. With purchase of any whole sandwich. Limit 1. Not valid with any other offer or discount. Limit one coupon per customer, per visit, per table. No cash value. Excludes taxes, gratuity, alcoholic beverages & gift card purchases. DINE-IN ONLY. Monday-Thursday Excludes bu et. Expires 3/31/17. Valid at the South Jordan location only. Jump into Spring Organization – Is there an App for That? common question I’m often asked is, “how do you get so much done in a day?” After all, in addition to running a busy Coupons4Utah.com, I also own a travel blog, 50Roads.com and contribute to a grocery website Crazy4Smiths. com. I have a segment on KUTV, write this article monthly and still find the time to hang out with my out-of-state grandkids. Initially, this tough question left me struggling for an answer. After a little thought I realized my most productive days come down to one handy tool. No, it’s not mood-altering drugs (good guess though). The answer is my phone. Now, if you’re like me in the 50-something age range, I know what you’re thinking, “Get a grip, we don’t need no stinkin’ phones!” And admittedly, I did just write an article about the importance of writing down your goals. So, let me be clear, I ALWAYS put my phone away during meals and it NEVER goes to bed with me (two habits I highly recommend for everyone). I’m of the mentality that I own my phone, it doesn’t own me. And while some days it proves to be more of a distraction, this one tool can keep me productive all day. Here are a few apps I use that you could find useful too. Grocery: ListEase is a free grocery app for your phone and even works with an Apple Watch. After a brief learning curve and initial set up, I found it easy to use for not only groceries, but for to-do lists to. There’s even links to coupons. If you’re a Smith’s or Macey’s shopper they both have great grocery list apps with coupons too. Photos and Kids’ Art: Keepy is a new free app that allows you to organize kids’ artwork and allows the user the ability to share it with family members who live far away. The app also allows you to record voice-over stories about your photos. Google Photos: There are tons of apps out there with cloud storage, but my personal favorite is Google Photos. It’s easy to use, free and offers editing options. A premier health and wellness company offering world-class energy, weight-loss, nutrition, and sports performance products along with a rewarding business opportunity. Call or Text to setup FREE consultation. We’ll buy your non-running, wrecked or broken car, truck or van.